A few years ago, Marisa Lynch gave herself a fashion challenge: make 365 wearable items for 365 dollars. She shopped at thrift stores and garage sales. I admired her emphasis on reusing existing clothing, but I was even more taken with how she did it. She bought items that were the wrong size or in the need of repair and then altered them to make her new wardrobe. The strapless dress I started with. 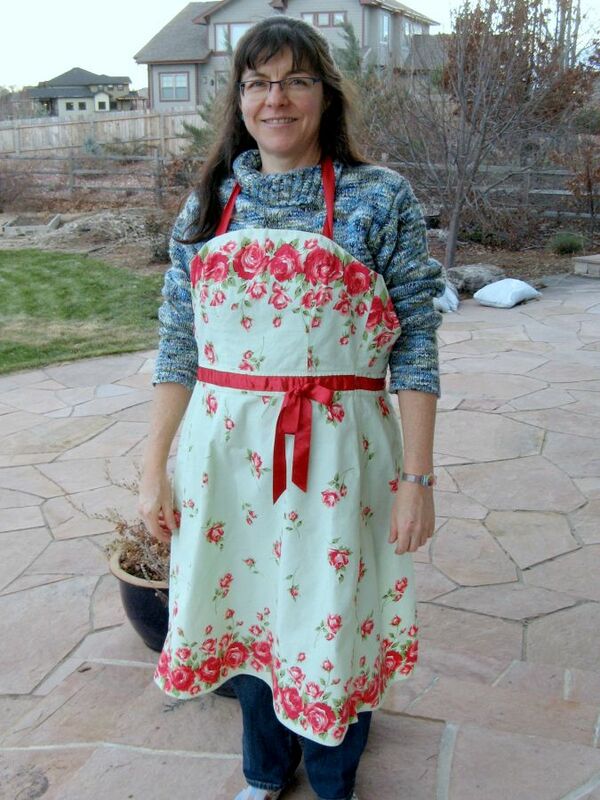 For a long time, I’ve been in need of an apron, and I thought this would make a fun dressy one, perfect to wear when hosting dinner parties. I bought myself 3 yards of ribbon to match the ribbon on the dress and got to work. 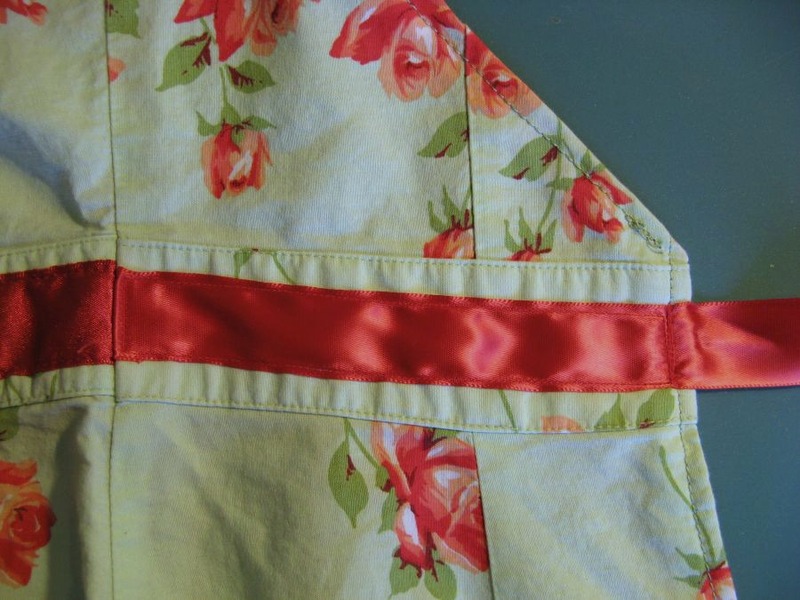 First, I opened the dress up along the seam in the back. I extracted the zipper and saved it to use later (just like Marisa would!). 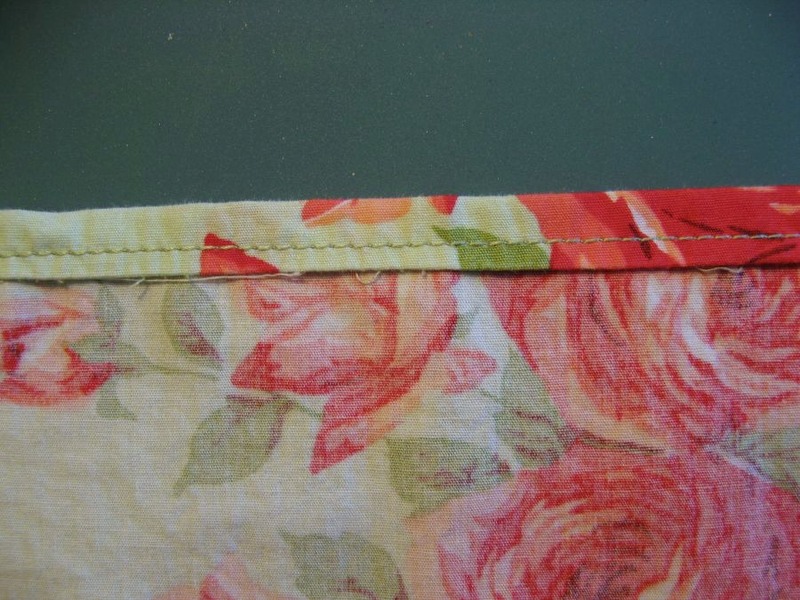 Then I pressed the raw edges over and sewed them down for a finished edge. Just roll under and stitch! To place the ribbons, I laid the dress on my front and looked in the mirror. 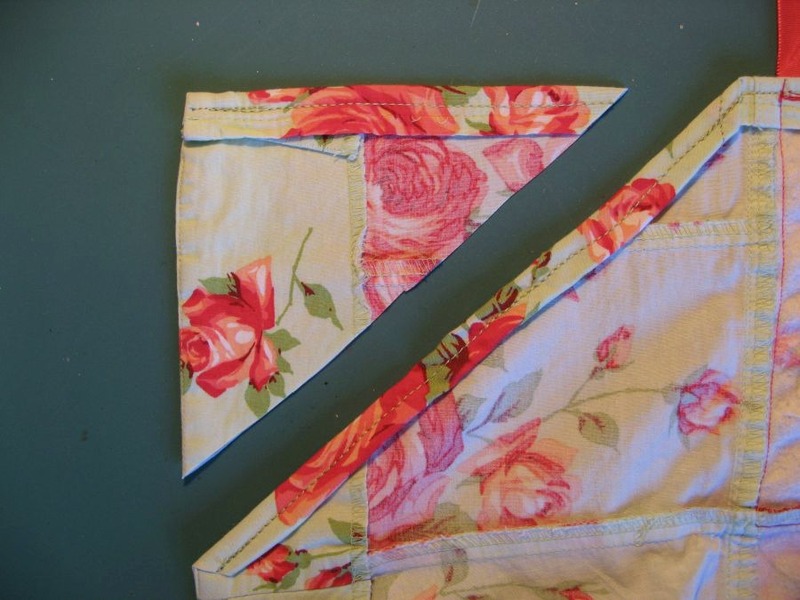 I cut two 32″ pieces for the waist ties and two 22″ pieces for the neck, completely using up the ribbon I’d bought. I stitched along the edges of the waistband ribbon and made sure the raw edges were turned under and tacked down for all of them. The loose ends are all cut on the bias to keep them from unraveling. 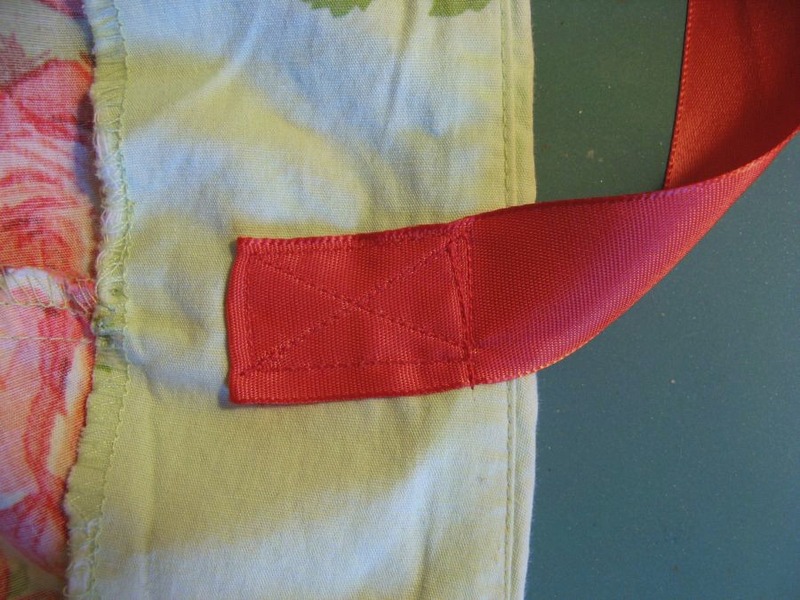 I tacked the waistband ribbon down with extra stitching since it will be under stress. To keep the stitching from coming through onto the front, I temporarily removed the tacking stitches that hold the facing down. Last of all, I trimmed off some excess fabric that was flapping around and finished the cut edges. 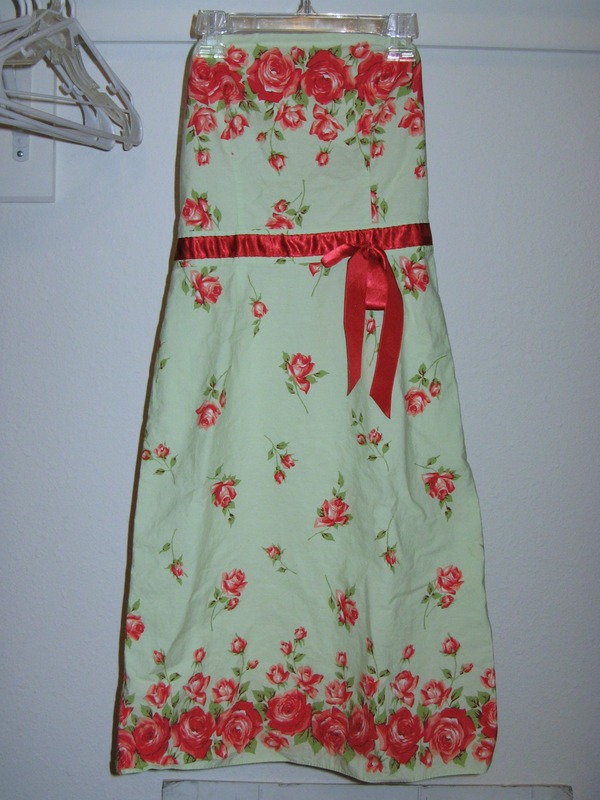 It took less than 2 hours to turn the dress into an apron, and I loved the results! So much more interesting than an ordinary store-bought apron.